Heat stress is a situation where the body absorbs too much heat, leading to stress, illness, or even death. This occurs when the body is not able to cool itself enough to keep its temperature within the normal range of 36.5-37.5 °C (97.7-99.5 °F). The body normally cools off by sweating, but sometimes sweating is not sufficient and the temperature keeps rising. Thus, if the body is exposed to and gains greater heat than it can dissipate, its temperature control mechanism starts to fall under pressure. This can be detrimental to the normal functioning of the body by disrupting its normal metabolism and chemical balance. Residing in places with a tropical climate where your body is regularly exposed to high temperatures, especially during the summer months. Continued sun exposure or strenuous physical activity in work environments with unfavorable heat conditions, such as high temperatures, high humidity, and lack of air conditioning can make you prone to heat stress. Prolonged inflammatory illnesses, such as infections, often result in fever, which is a direct manifestation of heat stress in the body. A hormonal imbalance instigated by a thyroid disorder called hypothyroidism leads to increased metabolic activity in the body. The direct fallout of this is increased body heat. Loading up on spicy, greasy, and fatty foods as well as a high-protein diet can contribute towards increased body heat. The same holds true for caffeinated or alcoholic beverages. Strenuous workouts, laborious work, or any other form of physical exertion can cause your body temperature to rise on account of the stimulated muscle activity and related blood circulation. Staying in crowded and confined spaces for too long can lead to heat stress. Having certain medical conditions such as arthritis, leukemia, and neurological disorders can have a bearing on the temperature of your body. Medications such as antibiotics, opioids, and antihistamines affect the body’s temperature as well. Dehydration results in reduced sweating, which is the body’s way to cool itself down. Thus, if you are dehydrated, you will find it difficult to maintain a normal body temperature. Follow the mantra of “less sun, more shade” when the heat outside gets unbearable. Spend as much time indoors as possible, venting the heat away in front of an air conditioner, cooler, or fan. Don’t sit or leave anyone else, especially children, the elderly, and pets, in a parked car for too long. Even if the car is parked under a shade or the temperature seems milder than usual, sitting in a parked car can be dangerous and even fatal as cars themselves tend to heat up to high degrees. Don’t subject your body to sudden and drastic alterations in temperature. If you spent most of your time in air-conditioned spaces, allow your body to acclimatize to the hot weather conditions by gradually increasing the time spent in the heat. Refrain from engaging in too much physical activity during the hottest parts of the day, and schedule the bulk of your strenuous work to those hours when the temperature is a bit agreeable, such as early morning or late evening. If you actively participate in athletic activities or other physically demanding events, make sure there is always medical help available in your area of practice. If you are on certain medications that can diminish the body’s ability to sweat out the heat or have a history of heat-related illness, limit your exposure to adverse conditions that can trigger increased heat stress and act promptly on any symptoms of overheating. Manage your weight as high body mass often hampers the body’s ability to regulate its temperature, leading to heat retention and heat stress. Keep yourself abreast of the weather forecast by listening to the radio and television and plan your day accordingly. Carry a water spray bottle or wet wipes with you to help cool your face and body when the heat starts getting to you. Relaxation techniques such as putting on some pleasant music or sound recordings of waves crashing or birds chirping will help you drift away to a better place and keep your mind off the heat. Igniting refreshing aromatic candles can also help. Meditation and light yoga can also help your mind and body cool off. Body heat is not a disease but it should not be taken lightly. If left untreated, it can develop into a heatstroke. Because heat stress can rapidly escalate to a life-threatening heat stroke if not attended to in a timely and appropriate manner, one must not take it lightly and always be prepared for any medical emergency. One of the foremost precautionary measures is to know the difference between heat stress and a heat stroke. Transfer the individual out of the heat and to a cooler place. Remove the clothing to allow the body to cool down faster. Position the person on his or her side to minimize aspiration. Plunge the individual in cold water or apply cold, damp cloths or ice packs to the person’s neck, armpit, and groin areas, where large blood vessels are located to lower the body temperature. Fanning the person continuously is also recommended. Continue this until the body temperature drops to 101 °F to 102 °F (38.4 °C to 39 °C). Abstain from administering any fluids to the person if his/her consciousness seems compromised or altered. If the person is alert or responsive and asks for water, give small sips of the fluid. Because aspirin and acetaminophen do not have any cooling effect on the body, its best to avoid them in this situation. Heat stroke can end up ravaging multiple organs in the body, including the brain, liver, kidneys, and muscles (muscle breakdown or rhabdomyolysis). Delay in treatment can also render the affected individuals with permanent neurological damage and can even be fatal. If the symptoms are mild, you can try home remedies. There are several easy yet effective methods to address this problem. Here are some home remedies to reduce body heat. As soon as you notice an increase in body temperature, drink a tall glass of cool water. Then, sip some cool water every 15 minutes. This will help prevent dehydration, which can worsen your condition. Another option is to add ice cubes to a foot tub filled with cool water. Immerse your feet in the bucket for 15 to 20 minutes. You can also enjoy a cool bath to reduce body heat. Coconut water is another effective remedy to help treat heat exhaustion. Its electrolyte composition is excellent for rehydrating the body. Plus, it is loaded with nutrients that help lift your energy levels. Regular use of lemon can keep the body cool and prevent heat-related illnesses. The high vitamin C in lemon can help lower body temperature. It also hydrates and oxygenates the body to keep you feeling energized and refreshed during the endlessly hot summer days. Owing to its menthol content, peppermint has come to be regarded as a natural cooling agent. It is a versatile ingredient that can be added to an array of dishes, consumed as part of a hot or cold tea, and used as an aromatic and soothing addition to therapeutic baths. Each of these peppermint applications is an effective remedy to reduce body heat. Furthermore, peppermint also helps relieve other symptoms such as nausea and headache. Simmer a few ounces of fresh peppermint leaves in a pot of boiling water for 15 to 20 minutes. Strain out the leaves and allow the water to cool. Add this water to a bathtub filled with the cool bath water and soak in it for at least 20 minutes. You can also prepare a peppermint bath by adding a few drops of peppermint essential oil to cool bath water. Alternatively, Steep 1 teaspoon of fresh or dried peppermint leaves in 1 cup of hot water. Strain and sweeten the tea with a little raw honey. Cool it in the refrigerator and enjoy your cool peppermint tea a few times a day. 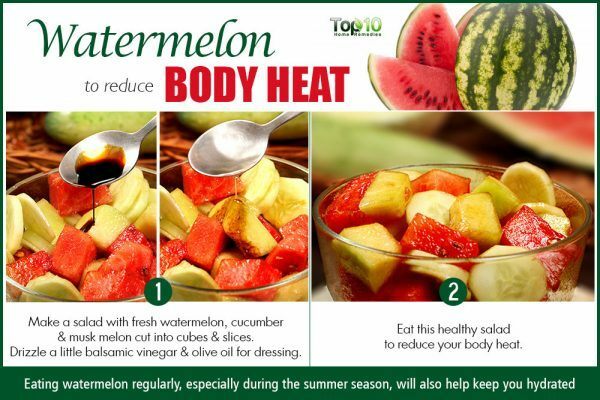 Because watermelon is mostly made up of water, it is especially effective as a hydrating agent and in bringing down elevated body temperature. A potent detoxifier, this fruit helps remove harmful toxins from the body, which can contribute to body heat. Eat a few slices of watermelon, or combine it with some cold milk and sugar to make a refreshing drink. You can also mix cubes of watermelon with cucumber and muskmelon. Then, drizzle a little olive oil and balsamic vinegar over it to make a healthy salad. To make it all the more satisfying and balmy, store it in the refrigerator before application. 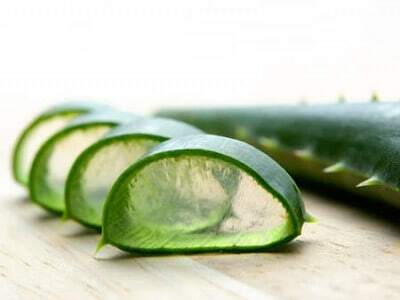 Extract fresh aloe vera gel from an aloe leaf and rub it over your body. Leave it on for at least 20 minutes, and then take a cold bath. Repeat as needed. You can also drink a glass of homemade aloe vera juice prepared with up to 2 tablespoons of aloe vera gel. Note: Do not consume more than 2 tablespoons of aloe vera gel a day. Buttermilk is an Ayurvedic favorite for combating heat stress, due to its probiotic-rich and heavy-duty vitamin and mineral content. 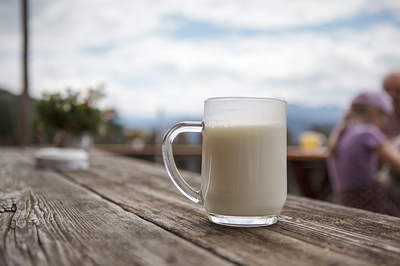 This lethal composition makes buttermilk a tonic that replenishes the body by making up for the fluids and nutrients lost due to excessive perspiration as well as by improving metabolism. Add a glass of buttermilk to your breakfast during summer months to keep your body cool throughout the day. You can even fix up a buttermilk alternative at home by mixing ½ cup of thick yogurt with some water and adding a pinch of salt to it. Enjoy this homemade buttermilk twice daily. Coriander, also known as Chinese parsley, is effective in regulating body heat, especially during the summer months. There’s a whole variety of preparations that can put this leafy green herb to good use, which only works to make your food and drinks more appetizing to the nose, eyes, and taste buds. What’s more is that coriander boasts a whole list of nutrients that make it a great value addition to any meal. Fresh coriander juice protects the body against sunstroke. Also, when consumed on an empty stomach, this health-giving potion helps detoxify the body. Alternatively, clean and chop coriander leaves. Heat water in a vessel over medium flame, add the coriander leaves and let it boil for 10 minutes. Remove the pot from the stove and let it cool. Strain the coriander water, add lemon and salt, mix well, and enjoy! Coriander chutney is also a popular side dish which can be prepared by grinding and mixing mint and coriander leaves to form a paste, and adding lemon juice for the extra zing. Shield your skin from sunburn by slathering copious amounts of sunscreen on it with an SPF of at least 15 and reapplying it every 2 hours, more so if you are going for a swim or are prone to over-perspiration in general. Summer accessories such as a wide-brimmed hat and sunglasses are also recommended every time you step out in the sun for long periods. A parasol or umbrella can also help safeguard you against the dizzying glare and heat of the summer sun. Strip away any extra or unwanted layer of clothing that you might have on, and keep yourself as light as possible. Try to stick to an understated color palate for your summer wardrobe, with a lot of whites, pastels, and other subtle shades that reflect sunlight. The best fit for clothes to wear during summer is loose. Baggy, easy-fitting clothes made from feathery fabrics such as cotton, linen, or silk are ideal to beat the body heat. Semi-synthetics such as rayon and modal also provide a suitable alternative for combating the rising temperatures. Regular exercise can help prevent heat exhaustion in the long run as it allows your body to adjust to hot conditions. Do not eat nuts daily as they can increase heat in the body. Try to have them two or three times a week only. Ramphal L. Heat stress in the workplace. Proceedings (Baylor University. Medical Center). https://www.ncbi.nlm.nih.gov/pmc/articles/PMC1312229/. Published October 2000. Kenny GP, Yardley J, Brown C, Sigal RJ, Jay O. Heat stress in older individuals and patients with common chronic diseases. CMAJ: Canadian Medical Association Journal. https://www.ncbi.nlm.nih.gov/pmc/articles/PMC2900329/. Published July 13, 2010. Glazer JL. Management of Heatstroke and Heat Exhaustion. American Family Physician. https://www.aafp.org/afp/2005/0601/p2133.html. Published June 1, 2005. Smith JE. Cooling methods used in the treatment of exertional heat illness. British Journal of Sports Medicine. https://bjsm.bmj.com/content/39/8/503. Published August 1, 2005. Nurmayanti D, Darjati, Nerawati D. Coconut Water as Enhancer Productivity of Labor Exposed to Heat. Journal of Natural Sciences Research. https://www.iiste.org/Journals/index.php/JNSR/article/view/32239. Published 2016. S, Melo Dde, Menezes, et al. Improved exercise capacity in the heat followed by coconut water consumption. Motriz: Revista de EducaçãoFísica. http://www.scielo.br/scielo.php?script=sci_arttext&pid=S1980-65742014000100107. Published 2014. Rafiee F, Mazhari M, Ghoreishi M, Esmaeilipour O. Effect of lemon verbena powder and vitamin C on performance and immunity of heat-stressed broilers. Journal of animal physiology and animal nutrition. https://www.ncbi.nlm.nih.gov/pubmed/26833391. Published October 2016. Barwood MJ, Corbett J, Thomas K, Twentyman P. Relieving thermal discomfort: Effects of sprayed L‐menthol on perception, performance, and time trial cycling in the heat. Scandinavian Journal of Medicine & Science in Sports. https://onlinelibrary.wiley.com/doi/full/10.1111/sms.12395. Published May 6, 2015. Samadi F, Dastar B, Ameri SA. Efficiency of Peppermint (Mentha piperita) Powder on Performance, Body Temperature and Carcass Characteristics of Broiler Chickens in Heat Stress Condition. Iranian Journal of Applied Animal Science. http://ijas.iaurasht.ac.ir/article_526645.html. Published December 1, 2016. Bergeron M, Richardson CL, Roetert EP. Physical Activity in the Heat: Important considerations to keep your students safe. Strategies. https://shapeamerica.tandfonline.com/doi/abs/10.1080/08924562.2012.10590970?journalCode=ustr20#.W9qQXzFoTIW. Published 2012. Watermelon; A Fruit-Filled With Healthy Benefits. C Diff Foundation. https://cdifffoundation.org/2018/06/04/watermelon-a-fruit-filled-with-healthy-benefits/. Published June 4, 2018. Wakefield ME. Aloe vera. ScienceDirect Topics. https://www.sciencedirect.com/topics/medicine-and-dentistry/aloe-vera. Published 2014. Miners AL. The diagnosis and emergency care of heat-related illness and sunburn in athletes: A retrospective case series. The Journal of the Canadian Chiropractic Association. https://www.ncbi.nlm.nih.gov/pmc/articles/PMC2875908/. Published June 2010. Recognize Heat Illness. Division of Environmental Health. https://www.maine.gov/dhhs/mecdc/environmental-health/heat/recognize.html. LUNDGREN-KOWNACKI K, DAHL M, GAO C, et al. Exploring how a traditional diluted yogurt drink may mitigate heat strain during medium-intensity intermittent work: a multidisciplinary study of occupational heat strain. Industrial Health. https://www.ncbi.nlm.nih.gov/pmc/articles/PMC5889929/. Published March 2018. EL-Shoukary RDM, Darwish MHA, Abdel-Rahman MAM. Behavioral, Performance, Carcass Traits and Hormonal Changes of Heat Stressed Broilers Feeding Black and Coriander Seeds. Journal of Advanced Veterinary Research. http://www.advetresearch.com/index.php/AVR/article/view/79. Published 2014.
i hope these tips will help me very much for cooldown my body. Do mindfulness deep breathing.While inhaling Think U are taking cosmic energy which removes excess heat all toxins of body while exhaling. D o this at least 10 minutes at least three times a day.u will observe result in few days only. Deep breathing & mindfulness can remove any disease No drug required. Soak methi seeds in water & take it. Apply castor oil on head, palm & feet …just drop will do , at night , bed time. Many thanks for letting know the useful tips.